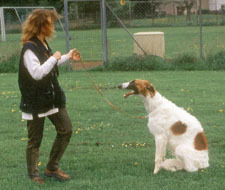 Dominance and trust are the bases of a successful dog education. They are bound together inseparably. Dominance without trust is a reduction to simple authority. 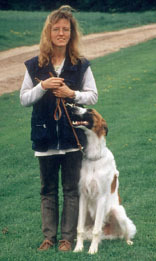 A dog can learn through authority, but it will never learn joyfully. As a consequence it will try to avoid learning and it will only fulfil its duties under the use of pressure. 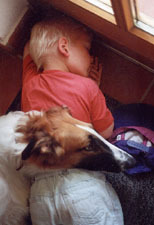 If a dog is to fulfil its future duties joyfully, there is no other waybut to establish a basis of trust first. This trust is usually installed through daily contact. One feeds his/her dog, strokes it, talks to it and plays with it, too. 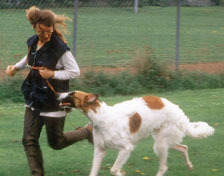 Playing with our dogs is extremely important in the context of dominance and trust. 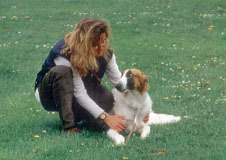 While playing all senses of the dog are stimulated simultaneously and it learns – as while playing with members of its kind – understanding our gestures, the different sounds of our voice and security of the close contact to our bodies. 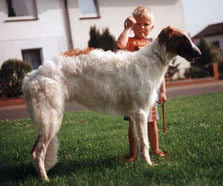 –Given always that we truly accept an open and free playing with our dog. 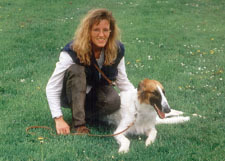 Due to my work at my dog-school I have realised that it is very difficult for many people to play in an unrestrained way with their dog. I think this is due to our education: an adult does not run across a meadow, clapping with his/her hands, throwing a ball or pretends fighting for an old towel, laughs and cheers “hey, hey, hey”. 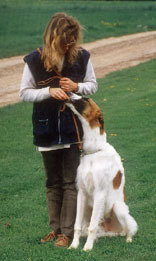 Neither does he/she allow his/her dog to ruin the expensive outdoor jacket or trousers. But: why not? A dog can’t really understand our inhibition in this context! 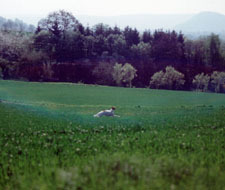 If we keep it at distance to remain “clean”, if we stalk over the meadow where we should play and if we don’t show our dog through gestures and voice how much playing with it pleases to us, we make one thing clear to our dog: We are nothing but a bore. 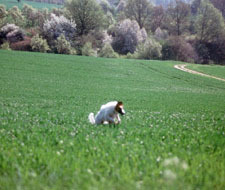 Logically the dog turns away and seeks for more interesting things, leaving us far behind. 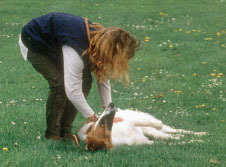 So: why not playing with our dog, lying on the floor, fighting for some old rags or fooling around outside, if there is no easier way to communicate with our dog in its own way, to have fun with it or to – and this is very important – create an atmosphere of positive expectation? If doing all this helps me creating this kind of “positive expectation” that makes my dog wonder: “What is going to happen next?”, I have gathered its attention in an easy and pleasant way. An curious dog will always be willing to learn, too. 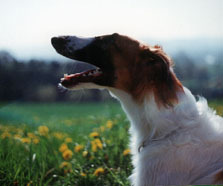 A dog which you only feed, stroke and care for will feel well, but it won’t expect anything exciting from human beings. So everything else, any distraction will be more interesting for it than we are. Again: Use any possibility that all day life offers you to play with your dog. It is nice and important. One rule should nevertheless be respected: it should be always you, the leader, who starts and ends the playing. In a pack the dominant animal would be very annoyed being permanently asked to play if it doesn’t want to. As always we should try to copy on natural behaviours of a pack. This is why you should clearly say “NO” if your dogs brings in toys and begs for playing while you sit at the coffeetable. The same counts for ending the game while our dog would still like to play on (always leave them hungry!!!). Expectations for the next play will be great this way. A very positive side effect of this beginning and ending of playing is that you show to your dog who the “boss” is, without using force or punishment, even without using a single harsh word. The “privileges” of being the leader of the pack, the freedom to feed, play, stroke whenever you feel like will be a kind of dominance that your dog won’t perceive negatively. On the contrary it will trustfully come close to you and wait for all you want it to do. 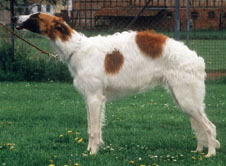 –Just as a dog would orientate its own behaviour according to the leader of the pack and its own position in the hierarchy of the pack. That’s when life is perfect for a dog. 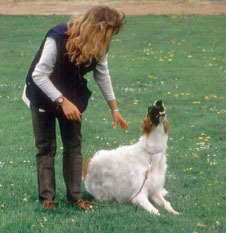 IF you offer chances to your dog to dominate it will use them (naturally). This often happens unrealised. You finally give in when your dog begs for food, play or a walk outside (just because you want rest....-you will NEVER get it that way). When these things happen I must finally realise that I have lost my leading position in the pack. And I must work hard and fast to regain it or I might get serious trouble with my dog. 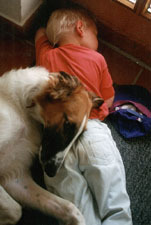 Dogs that show the described above ways of behaviour are not at all thankless. I often hear this from people who would really do everything for their dogs (....and then it behaves THAT way....). No it is not at all thankless, it HAS TO follow its natural instincts and behave like this. One last remark: hectic and neurotic dogs that never come to rest are often the result of an inconsequent education. The dog constantly switches between dominating and being dominated for it never knows if it has to fight for its dominance (...back off!! This is my food!) or if it should give in to pressure and force (...because we can’t let everything go through!). It is important to first think about what a dog is allowed and what it isn’t. What is allowed once should be allowed forever and what isn’t should be forbidden forever as well. –For the sake of you dog! 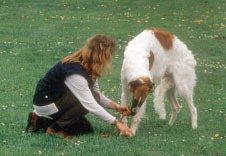 Offer your dog the peace and satisfaction of a strict and clear order –as the one of a pack. 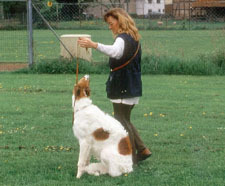 Create trust and dominate – and the way for a successful dog education is right in front of you! Please go on! What shall we do now? as long as Leon sleeps, the dog won't get up.